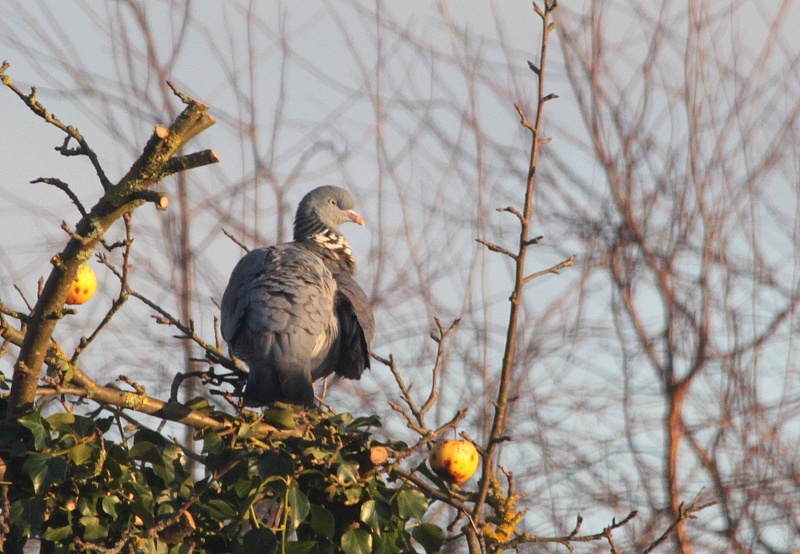 This pigeon was standing on top of our neighbour's ivy choked apple tree this afternoon, enjoying the sunshine and checking out the locale. This shot was taken with the lens at full zoom and through a double-glazed window. It's also been quite heavily cropped. I sharpened the image a bit and upped the contrast a little but thought they were quite reasonable adjustments to have to make under the circumstances. The background's a bit distracting but the shot wouldn't bear cropping any more and the whole thing improves on large view. Gareth has gone home after enjoying lunch out with us at our favourite tearoom (at his request). My back's still crummy but I'm a little more mobile today. Let's hope things continue to improve. Fingers crossed. Love the sunlight on him!! I love the intent look in his eyes! Nice lighting too. Nice one. Fun expression on his face! I like how you have composed the picture. Good light and colour. oh poor back, what a pain (literally)! @sarahhorsfall Cheers, Sarah. It's my own silly fault that it slipped, I'm ashamed to say.